Sam Sam wrote this story and was read by 230 people. For free. Meet Goliath. 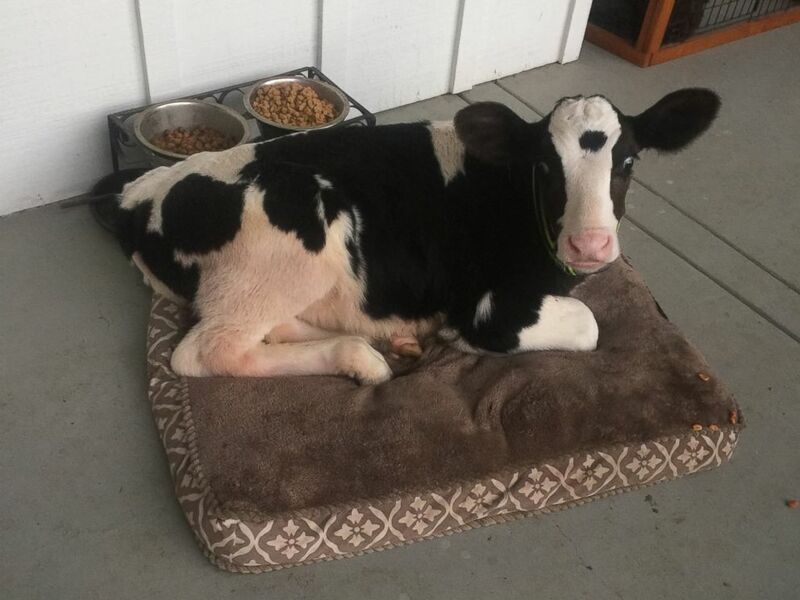 He's an adorable baby cow who's convinced he's a dog. Goliath, who's actually a small calf, was rescued nearly two months ago from a dairy farm that was planning on slaughtering him, according to Shaylee Hubbs, a high school senior who lives with her family on a ranch in Danville, California. Though Goliath was "so weak and so small that he couldn't stand and you could pick him up very easily" when the family first got him, they've now nursed him into a healthy 8-week-old calf, Hubbs told ABC News today. The only thing is that he doesn't think he's a cow at all. "I'm pretty sure he thinks he's a dog," said Hubbs, 17. "He was raised with our three dogs, and he's around them every day. They chase and play together, he watches how they eat their dog food and drink water from their bowls and copies them and he even lays in their dog beds. He even loves scratches on his neck around his ear."